Going zero waste has a way of changing you. Some days you feel growing pains (it can be pretty intense examining your wasteful habits up close), but other days you feel like you’re stepping into something new and magnificent. Since going zero waste, I’ve noticed marked differences in my overall health and wellbeing––improvements that go far beyond reducing what goes into my garbage can. Being conscious of the garbage I produce has initiated a ripple effect of well-being and mindfulness in other areas of my life. I would even argue that it has made me a better person––that by stepping out of my autopilot ways has brought about overwhelming goodness in my life and even positively impacted my community. Here are some of the ways that I have personally seen my life and actions improve by going zero waste over the past year. 1) I am a more mindful consumer. I used to shop without care for social and environmental impact. If the item was a good deal and served my immediate purposes, that was enough for me. Today, I have taught myself how to evaluate a company’s ethical and sustainable impact, asking questions like: Did the manufacturer of this product pay its workers a fair wage? Was this product produced in a sustainable manner? Is it toxic to me or to the earth, now or in the future? 2) I am more in tune with the cycles of the earth. 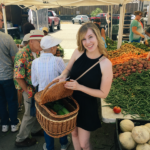 One of the first zero waste changes I made was to start shopping for groceries at our local farmer’s market. This practice helped me get more familiar with which fruits and vegetables grow during each season. I now cook meals that are made with local produce and I love it! 3) I have become more aware of how my actions directly affect others. One of the best things you can do to live a more beautiful, authentic life is to step out of your bubble and look beyond yourself and into the lives of others. Because I have experienced the ways my consumeristic nature affects people in different life spaces than me, I am better able to practice empathy and compassion. 4) I am more inclined toward meditation and slow living. Ahhhh, doesn’t it feel great to take it slow? Because of zero waste, I have learned to value slow living––taking to heart what it means to live with purpose and intention. My mind is also less busy with stuff, releasing me to experience the world more fully. 5) I have chosen to eat a plant-based diet. My husband and I ate a classic, all-American diet when we first started going zero waste. However, after a few months it became pretty clear that buying meat and cheese plastic-free was next to impossible where we live. We started educating ourselves about the environmental impact of eating meat, and within six months of going zero waste had gone vegetarian as well. 6) I always choose organic. Eating fresh organic produce from our farmer’s market every week is such a blessing! But this bent towards organic has spread far beyond just food. Other pesticide-free items in our home include linens, furniture, essential oils and cotton clothing. 7) I have banished chemical products from my life. When you start reducing household waste, chemical products tend to go out the door with it. We swore off chemical cleaning solutions, toxic air fresheners, and artificial beauty products right away, opting for healthy, homemade solutions like this all-natural countertop cleaner instead. 8) I am more eager to share what I know. The more I learn about zero waste living and sustainability in general, the more excited I get to share about it! It was for this reason that I launched my “30-Day Zero Waste Baby Steps Challenge” on the Zero Waste Memoirs. I want everyone to have easy access to information about zero waste living and to have an opportunity to ‘dip their toes’ into the zero waste lifestyle without overwhelm. 9) I am more inclined toward minimalism, rather than consumerism. Decluttering is easily one of my favorite activities. I love the fresh, unrestrained feeling that comes with freeing yourself from clutter and approaching life with a less-is-more attitude. Plus, my time spent cleaning up the house has significantly lessened! 10) I am more open to change. Going zero waste requires a mixture of intentionality, preparedness and flexibility. You have to roll with the punches on a daily basis, but you also need to be able to initiate change on your own. Over time I’ve grown more comfortable with change and I accept that my life may not always look like it used to. Last year I was drinking out of plastic water bottles; today I’m the girl carrying a mason jar and bamboo utensils in her purse wherever she goes. And I’m all the better for it. Are there any lifestyle changes you’ve made that have seriously affected who you are as a person? I’d love to hear your story! Lauren is a creative copywriter, blogger, and illustrator living and working in the wild west of Wyoming. Most days you will find her writing in a coffee shop, hiking in the Rockies, or turning up swoon-worthy vintage treasures. You can learn more about Lauren at her writer's website lauren-bowen.com, or at her sustainable lifestyle blog, The Zero Waste Memoirs.